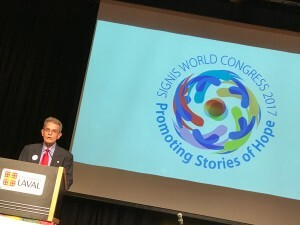 The highlight of any Congress is the sharing of stories and experiences by fellow communicators gathered from all corners of the globe, Gustavo Andujar, President of SIGNIS told delegates gathered at the opening plenary of the SIGNIS World Congress 2017 taking place in Quebec City from June 19 – 22. 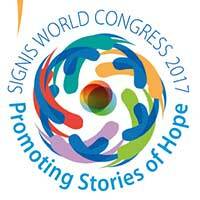 The theme of the Congress is ‘Media for a Culture of Peace: Promoting Stories of Hope’. The first plenary ‘Communicating Hope’ highlighted how different organisations put the vision of promoting stories of hope into practice, particularly using communications and media in creative ways. Prof David Mulroney, President and Vice-Chancellor of the University of St Michael’s College, Toronto, spoke about his appointment to reignite the Catholic identity of the College. The University had become siloed and St Michael’s had lost its sense of community and vocation. “There was a sense of ambivalence, a disconnect with Catholic institutions and there was no hiring for ‘mission’. This entry was posted in Bishops, Special interest and tagged Communications Congress, Digital media, Media relations, SIGNIS on June 21, 2017 by ACBC Communications.